This entry is cross-posted from the G.S. 132 Files, the official Records Management blog of the State Archives of North Carolina. In recognition of Electronic Records Day 2017, sponsored by the Council of State Archivists (CoSA), the State Archives of North Carolina presents the short film “The Texting Club.” This video was created for educational purposes only. This entry was posted in Digital Services, Government Records and tagged COSA, Council of State Archivists, Electronic Records, Electronic Records Day, ERecsDay, public records, records management, text messaging, video on October 11, 2017 by Sara. October the 10th is Electronic Records Day, a time to share information and tools related to the management, access, and preservation of digital records. This year Lawrence Giffin wrote our Electronic Records Day post, while Francesca Perez and Jeremy Gibson created two Vine videos to remind everyone that threats to electronic records come in many forms. Learn more about Electronic Records Day from the Council of State Archivists (CoSA). North Carolina electronic records guidelines are available on the Digital Records page of our website. A digital records FAQ is also available on our website. See what other institutions have posted about 10/10 on Twitter by following the hashtag #ERecsDay. This entry was posted in Digital Projects, Electronic Records, News, Preservation and Conservation and tagged 10/10, Electronic Records, social media, Twitter, video, Vine on October 10, 2014 by Ashley. The State Historical Records Advisory Board (SHRAB) in collaboration with the State Archives of North Carolina has produced a series of tutorials that provide basic information about the care and handling of family papers. These tutorials were funded by a grant from the National Historical Publications and Records Commission (NHPRC). The complete series is available on YouTube and selected tutorials are also available in the Preservation section of the State Archives website. This entry was posted in Digital Projects, News and tagged conservation, disaster preparedness, Photographs, Preservation, SHRAB, tutorials, video on August 8, 2014 by Ashley. If you missed the June 23 Friends of the Archives talk “How did NC Get Its Shape: A History of the Boundaries Surveyed” by Gary Thompson, chief of the North Carolina Geodetic Survey, it is now available on the Department of Cultural Resources’ YouTube channel. If you want to learn more about the Friends of the Archives, including how to become a member, please visit their new web pages. This entry was posted in Events, News and tagged events, Friends of the Archives, video on June 27, 2014 by Ashley. We have added an extended lesson guide on Tiny Broadwick to the education section of our website. Who was Tiny Broadwick you ask? She was a true pioneer of aviation, from right here in North Carolina. Tiny Broadwick was a daring young woman who parachuted for the first time from a hot air balloon in 1908, when she was fifteen years old. 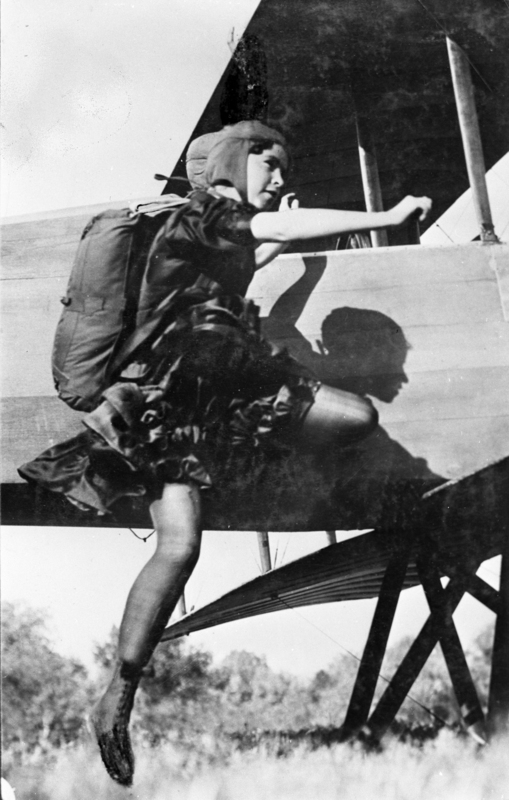 During her lifetime she made over 1100 jumps from balloons and airplanes. She is listed in the Guinness Book of World Records as the first woman to parachute from an airplane into water and as the first person to perform a “premeditated free-fall.” This brave woman was a little over 4 feet tall and weighed not much more than 80 pounds. To find out more about Tiny check out the short biography. The lesson guide also has fun facts and information that even non-students will find interesting to look through. Included in the lesson plan are two videos, filmed in the 1960’s that feature Tiny Broadwick. Tiny Broadwick is also featured in the Women in North Carolina 20th Century History collection part of North Carolina Digital Collections. This entry was posted in Digital Collections, News, Special Collections and tagged Lesson guides, lesson plans, Non-Textual Materials Unit, North Carolina Digital Collections, Photographs, Private Collections, Tiny Broadwick, video on May 8, 2014 by tiffmaz. Due to approaching inclement weather, the doors to the State Archives/State Library building will be locked at noon. The State Archives is always closed to the public on Mondays, so the impact for us should be minimal today. Should weather or road conditions tomorrow force us to delay opening the Search Room, we will update the public through our social media. This entry was posted in Closings and tagged hours, video, weather, YouTube on March 3, 2014 by Ashley. Need a History Fix for the Holidays? The State Archives of North Carolina will be closed December 24 – 26 for the Christmas holiday and January 1 for the New Years holiday. Although the Search Room may be closed, many of our other resources are still available to you. Here are lists of new materials or resources that you may have missed. Three new videos have been added to our YouTube channel. H. Lee Waters, Hillsborough, NC, January 19 and 20, 1937 – This silent, black-and-white film contains footage shot by H. Lee Waters (1902-1997) of Hillsborough, North Carolina in Orange County on 19-20 January 1937. Mr. Williams Wakes Up, 1944 [MPF.18] – The role and functions of local and state health agencies are described through the use of an imaginary character named Mr. Williams in this black-and-white film directed by George Stoney and shot in Wayne and Duplin Counties, 1944. Tar Heel Family, 1951 [MPF.32] – Printed and released in 1951, North Carolina’s transition from an agrarian economy to an economy based more on industry is described, featuring the Town of Clinton, NC. Got any obsolete free General Statute books? This entry was posted in County Records, Digital Collections, News, State Agency Records and tagged audio visual materials, North Carolina Digital Collections, records management, United States Civil War, video, YouTube on December 23, 2013 by Ashley.